In the kingdom of Ayortha, who is the fairest of them all? Certainly not Aza. She is thoroughly convinced that she is ugly. What she may lack in looks, though, she makes up for with a kind heart, and with something no one else has–a magical voice. Her vocal talents captivate all who hear them, and in Ontio Castle they attract the attention of a handsome prince – and a dangerous new queen. In this masterful novel filled with humour, adventure, romance, and song, Newbery Honor author Gail Carson Levine invites you to join Aza as she discovers how exquisite she truly is. 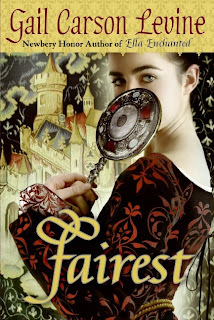 Fairest was the perfect book to yank me out of my reading slump. I adored this book. I remember really enjoying Ella Enchanted, but Fairest stole my heart. I read it perhaps too quickly, but I had no choice in the matter. The entire story just pulled at my heartstrings too much for me to put the book down. I love how Gail Carson Levine took the main points of a classic fairytale like Snow White and turned everything else around, reworked it, made it her own. I wasn't sure about all the singing included in the book at first, but then I really got into it. And I completely related to Aza's poor self-image issues. I thought the relationship between Aza and Prince Ijori was cute, but what made this book great for me is the relationship between Aza and her adoptive parents and Aza and her relationship with the gnome zhamM. Maybe it's because belonging is something that I long for, that I search out and can never find, but reading about these people accepting Aza into their family so easily and readily made me tear up on more than one occasion. It's what I bring to the book and so not everyone will feel that as strongly as I have done, but there we have it. My favourite song of the book is from Aza to zhamM, the gnome who cares for Aza after she is exiled from Ontio Castle. I can never stop thanking you. A river rushes between us. or a diamond for a song. My family keeps an inn. You have a chamber in my heart. I have this and Ella Enchanted on my list, after reading such fabulous reviews by Nymeth. She finds such wonderful books. Isn't it nice how sometimes a book comes along at just the right time? This one sounds like a keeper. Scrap Girl - yes, I love Nymeth's reviews! She seems quite influential for a lot of people. JG - Yes, I do really love when books fall into my lap with perfect timing!